Campaign against US billionaire which drew accusations of anti-Semitism declared over, said to have met its goals. 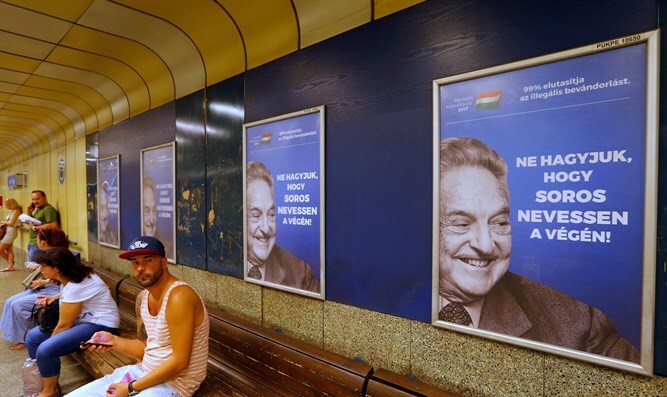 The Hungarian government will reportedly remove the posters which used as part of a campaign against US billionaire George Soros ahead of a visit by Israeli Prime Minister Binyamin Netanyahu, Haaretz reported. The campaign, which criticized Soros' opposition to Hungary's immigration policy, was accused by Jewish leaders of stoking anti-Semitic imagery and feelings. Yossi Amrani, Israel's ambassador in Budapest, on Saturday called on Hungary to halt the anti-Soros campaign. "It's our moral responsibility to raise a voice and call on the relevant authorities to exert their power and put an end to this cycle," Amrani said. "I call on those involved in the current billboard campaign and those responsible for it to reconsider the consequences. "At the moment, beyond political criticism of a certain person, the campaign not only evokes sad memories but also sows hatred and fear." Israel later clarified its stance that criticism of Soros is reasonable as long as it does not become anti-Semitic in nature. The Hungarian government has announced that the it is ending the anti-Soros campaign because it has reached its goals, according to a report by the Hungarian television network ATV. Prime Minister Netanyahu will meet Hungarian Prime Minister Minister Viktor Orban in Budapest on July 15.